Ramadan is almost knocking the door. I am preparing some Khajur and Ramadan dishes for you so that you can use all these easy-to-make food recipes during this holy month. I’ve come up specially with this Khajur Milkshake as Ramzan recipe. It gives more stamina to your body. You can also have Khajur milkshake any time in the year, whenever the dates or khajur are available near your location. Dates or khajur are the rich source of proteins and vitamins. Khajur comes under the category of fruits. It is mostly eaten raw. During Ramadan, Muslims break their fast with khajur or dates. While residing in the Kingdom of Saudi Arabia, I came across many varieties of dates. At the Khajur market in Jeddah, the most popular ones are Ajwa, Amber, Sukary, Rutab and Kalmi. I already had all these dates. They are similar (not same though) in taste and sweetness. Dates have amazing health benefits too. They lower the risk of heart diseases, prevents anaemia. Dates are also helpful in curing abdominal cancer and maintaining blood pressure. I would suggest you to add Khajur in your daily diet. I always keep khajur in my kitchen. Since Ramadan is here, I want to share the Khajur Milkshake Recipe with you. You might feel full after having one glass of the milkshake as it contains milk, khajur and dry fruits. You can also take this healthy khajur milkshake even in suhoor (saheri) also if you are not taking in iftari. Let’s have a look at this easy recipe’s method and ingredients. In a bowl, soak the de-seeded khajur in the half-glass of warm milk for half an hour. 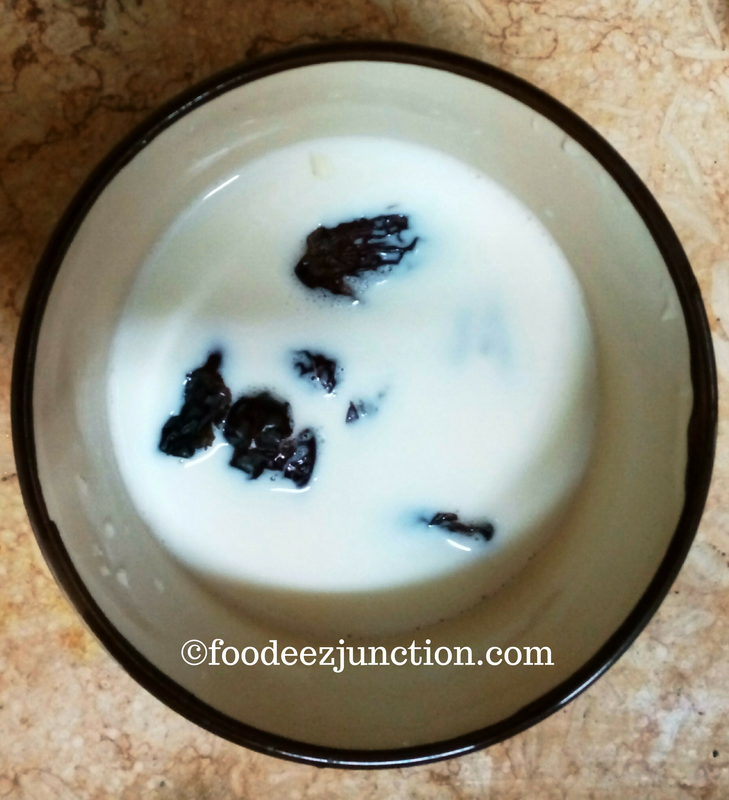 After half an hour, transfer the soaked khajur along with the milk in a blender. Now add the rest of the milk. Blend it nicely. Transfer in a serving glass, add whipped cream (optional) and all chopped dry fruits. Refrigerate it for an hour or two. You can add ice cubes too after cooling. Enjoy having this cool and nourishing Khajur Milkshake. Tips: For one glass of Khajur milkshake seven dates are enough. Still, if you want the milkshake to be sweeter then you can add a few more dates. If you don’t have enough time to soak the khajur in the warm milk, blend directly along with the milk but it would take more time. I shall be trying this one, I love dates and it’s great to find new uses for them! Sure.. let me know too how it was… if you love dates… you would love our upcoming another recipe… stay tuned and keep cooking!